Native to Iran, the pomegranate was probably one of the first fruits to be domesticated, along with figs, olives and grapes. Thanks to its thick skin that results in a longer shelf life and to its juice that quenches thirst during long desert crossings, the pomegranate was considered to be a basic food for nomads and travellers from the earliest periods of history. In Ancient Rome, where it was known as «malum punicum», which means «Carthaginian apple», it was appreciated as much for its sparkling red arils (pulp encased seeds) as for its sweet-tart flavour. Nowadays, pomegranate is fast gaining an excellent reputation among gourmets, and researchers are becoming very interested in its antioxidant properties. When buying a pomegranate, pick one with a dark and deep red skin, which gives off a metallic sound when tapped. 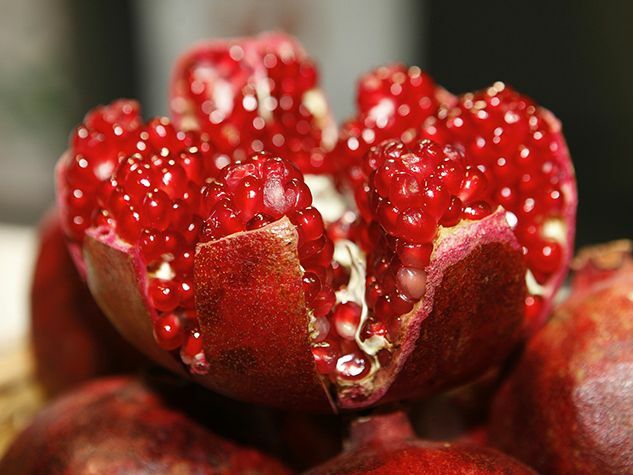 To separate the arils from the non-edible membranes that surround them, cut off the top stem end of the pomegranate without gashing the seeds, otherwise will make the juice leak out. Put the fruit in a bowl of water and separate the sections to remove the seeds; as these are heavier than water, they will sink to the bottom while the lighter membrane will float to the top. You can add pomegranate seeds to salads, desserts and ice creams or simply serve them up in a goblet, drizzled with Port wine like they do in Italy. But be careful, the juice stains are hard to remove (it was used to make ink in the olden days! ).